Love Korean cuisine, it’s comfort food for me. 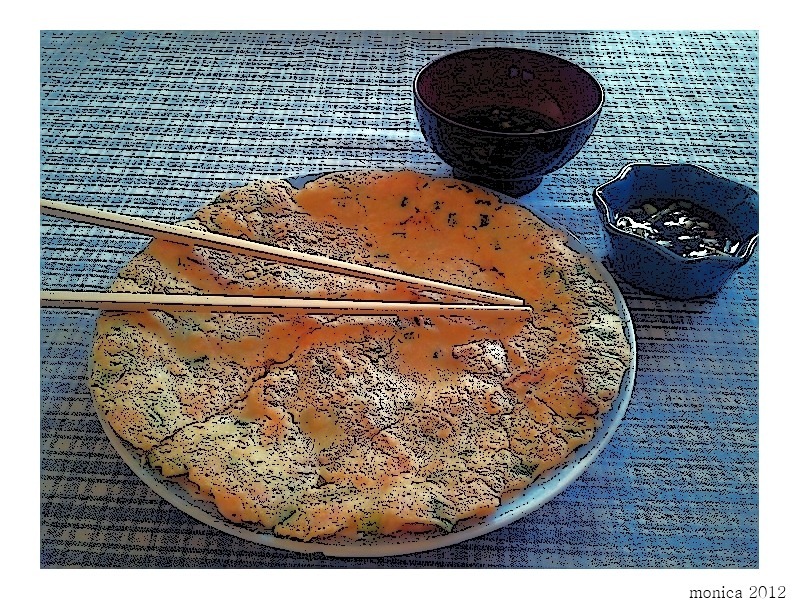 Yesterday, finally succumbing to the urge to cook Korean, I made seafood pancakes for dinner. I used a Korean mix I bought at H Mart and the pancakes turned out delicious. Today, wishing I had some leftovers I decided to try and make them in a gluten-free version. Belly full, here is something savory after all the sweet goodies I posted earlier. I washed and cut the green onions in long, thin pieces and prepared a thick batter combining the flours, a beaten egg, and some water. I added the green onion, the small shrimps and the calamari to the batter. I poured the savory mix on an previously oiled and heated pan. Let cook the pancake until golden-brown on both sides. 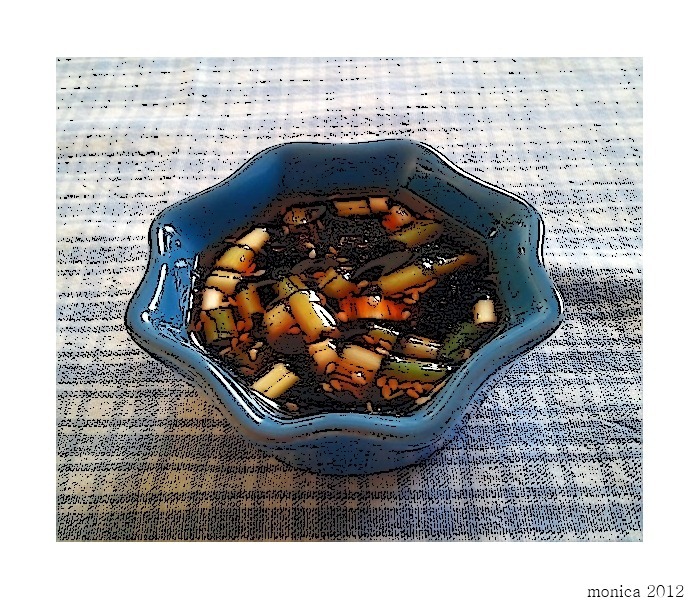 Meanwhile, I prepared the accompanying sauce mixing several tablespoons of the Tamari with one full tablespoon of vinegar, then I added the sesame seeds and the green onions cut in small pieces, and then diluted with some room temperature water. At the very end I spiced up the sauce with a few drops of the chili oil (Again, if you need the recipe to be gluten-free substitute the chili oil with plain chili flakes.) I served the pancake—turned out to be one big portion—on a plate and sprinkled the sauce on top. Obviously not the same flavor and consistency of the Korean seafood pancakes I eat at my friends’ house, but good enough to satisfy the craving without the bloating associated with the grain flour. Next time, I’ll play around with the flours, maybe using more cornstarch and rice flour than masa harina. Let you know if they’re any better. Enjoy.